In January 2018, the Solera String Quartet under Project: Music Heals Us piloted a one-week Beethoven Intensive Residency at Danbury Federal Correctional Institution. The facility helped us recruit twenty-five men who were interested in music, a diverse group of guys who were all in a pre-release program. Most of the men playing in one of the many bands at the facility. Many of the men were intermediate players, and some had a professional level of theoretical knowledge and instrumental accomplishment. The Quartet had kindly invited me to facilitate the workshop, which I was delighted to do. We planned various Beethoven-centric activities meant to open up the men’s curiosity about and experience of our single focal work of art, the Opus 95 String Quartet #11 in F minor. After some unexpected delays for lock-down and fog, we started with a live performance of the work. Molly, Miki, Andrew and Tricia each introduced a movement, making connections between their own personal and musical lives as well as with Beethoven’s life story and the music. This informal, intimate approach has proven popular with the incarcerated audiences that PMHU has been playing for. Each musician’s particular style of openness, responsiveness and curiosity became a useful model for the audience: I can feel this, notice this, wonder this; my personal connection with this music is valued. After the concert (the first of two planned for the beginning and end of the week), we switched into workshop mode. To establish a sense of community, we improvised a series of spontaneous riff-driven pieces with what we had at hand: a small pile of guitars, some hand percussion, our voices, body percussion, and the quartet. The men got to know us a little, and we got to know them as we sang and soloed: creating, responding to, or mirroring and supporting the musical creations of others. Beautiful musical textures rose up out of very simple beginnings. Everyone took pleasure in taking part, smiles and praise for each others work all around – all very satisfying and easy. 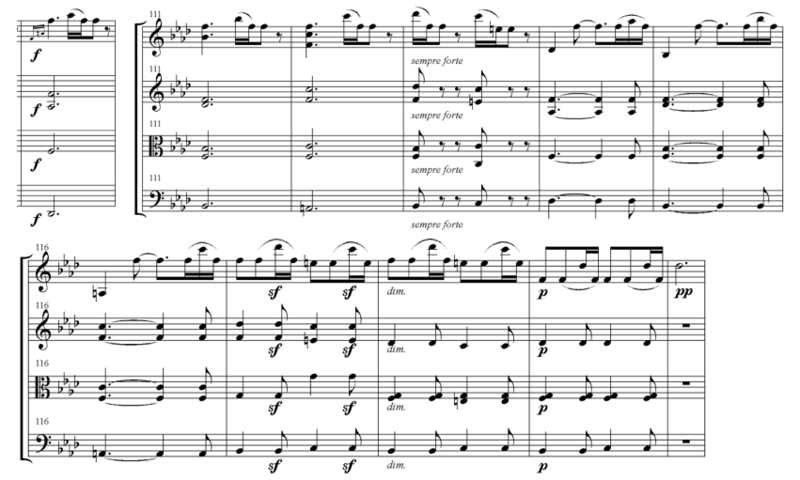 Interestingly, this singing of the themes became most effective, even powerful, when we sang and mimed the bowing for each melody at the same time as singing it. There was something about the physicality of the bowing, articulation, live instruments and vocalizing all coming together that made us all perform more musically and access a more visceral connection to each theme. Plus everyone seemed to enjoy playing air cello like a boss. · all discuss: what do you notice now? What relationships do we notice within an individual part? What relationships do we notice between the four parts? The conversations that I overheard as I drifted from group to group were, from a musical and arts education point of view, delightful. Sometimes a participant would be making connections between the instrument they had observed and a personal or emotional state. Some men asked the Quartet members their opinions about the passage, others offered metaphors and interpretive imagery in response to what they’d heard. The more experienced participants would wonder out loud about the technical, theoretical or analytical aspects of the passage: range, color, bowing, counterpoint. In all these moments I felt that the Quartet’s openness to the Hyper Focus process and our careful establishing of a creative (musically inquisitive, craft-conscious, and self-improving) community of learners (which honored both more- and less-experienced individuals equally) was paying off in a big way. The men were empowered to engage directly and personally with Beethoven, and express their questions and insights side-by-side with the musicians of the Solera Quartet, as respected and valued equals. We returned to the Hyper Focus activity with a different passage the next day, and the work was just as deep, unpredictable, and satisfying. Can’t wait to try it again, and to return to Danbury to see how the men connect their experience in the workshop activities with their second hearing of the full Opus 95 string quartet at our final concert. I’d like to think that any musical ensemble could use this Hyper Focus model to open up a work of art for workshop participants at any level, in any setting. For anyone interested in the way community-building effects creative work inside a correctional facility, you might enjoy reading my article The Container: Designing a Creative Atelier at Sing Sing Correctional Facility, published on Taylor & Francis Online in the latest issue of Teaching Artist Journal, Issue 3-4. For anyone interested in Teaching Artistry, or in this community-of-learners approach to teaching and learning, please keep an eye out for my forthcoming book from Oxford University Press, A TEACHING ARTISTS COMPANION, due to be published in late 2018. "You will never know... "
The amount of anticipation packed into this moment was surreal. I could feel each of these seconds were laden with the years of struggle and love we each had put into our instruments and art; the months of meetings, clearance paperwork, phone calls, emails, more phone calls, and more paperwork to clear every string, bow hair, pencil, score, and performer past the walls of the facility and into that very room; the days of seemingly incessant fights with the universe as we pushed through delayed international flights, freak floods, history-making arctic blizzards, and finally impossibly persistent fog with all its prison security issues(!)…. but we had made it. We had made it to this moment. Exhaustion - from so many days of stretching my heart to try to fit it around 35 men, wanting so badly to wrap each and every one of them up in our love and care. Fear - from the unknowns that always lurk behind prison walls. Exuberance, fulfillment, JOY! - from feeling like we finally conquered the universe’s obstacles and had made it into that classroom at long last to witness the smiles, comradery, and kindness being passed around the room. Pure Excitement! – “What did they create? What did they hear this week in Beethoven’s Op. 95 quartet that inspired them?? !” We were about to witness works of art coming to life for the first time in history! The room fell completely silent. We took a single unified breath and began to play….. In the ensuing weeks of standard rehearsing, performing, traveling, etc… my thoughts kept floating back to that classroom, wondering if my rhythm buddy was still witnessing music and song and collaborations. If Beethoven’s use of motif development was still the talk of the town. If Op. 95’s intensity of emotion and Beethoven’s commitment to hope and life was still inspiring new beautiful creations. Fear - from the bright lights and stares of the educated audience and all of the unknowns that always seem to lurk behind every turn of a phrase in any performance. Exuberance, fulfillment, JOY! – from knowing that I was exactly where I always wanted to be – making music in a string quartet. The room fell completely silent, and as we took a single unified breath to begin to play, I suddenly saw the excited, smiling faces of my rhythm buddy and all our residency composers and participants, heard all those hoots and hollers from just a few weeks before and remembered what it felt like to give every inch, drop, ounce, millimeter of my heart and soul to every note - not so that the audience would judge me as “Lincoln-Center-worthy,” but because it was needed. It was absolutely necessary. Anything less was just…wrong.